NFL players and league personnel will be required to "stand and show respect for the flag" and the national anthem if they are on the field, according to a statement from the league's commissioner on Wednesday. Robert Handa reports. NFL players and league personnel will be required to "stand and show respect for the flag" and the national anthem if they are on the field, according to a statement from the league's commissioner on Wednesday. But under the new policy, players who do not wish to stand for the anthem may stay off the field, giving people a way to demonstrate without the public spectacle that became a heated topic of national conversation last season. "This season, all league and team personnel shall stand and show respect for the flag and the Anthem. Personnel who choose not to stand for the Anthem may stay in the locker room until after the Anthem has been performed," Commissioner Roger Goodell said in a statement. "We believe today’s decision will keep our focus on the game and the extraordinary athletes who play it—and on our fans who enjoy it." The NFL will fine teams whose players do not stand and show respect for the anthem and flag while on the field. Anyone who does not stand for the anthem and flag on the field will be subject to "appropriate discipline" from the commissioner, according to the new policy. Last season, dozens of players decided to kneel or otherwise demonstrate during the anthem to draw attention to police violence against minorities and the treatment of Colin Kaepernick, the former San Francisco 49ers quarterback who was one of the first to protest that way. President Donald Trump turned the protests into a campaign issue, saying that players who don't stand for the anthem should be fired. 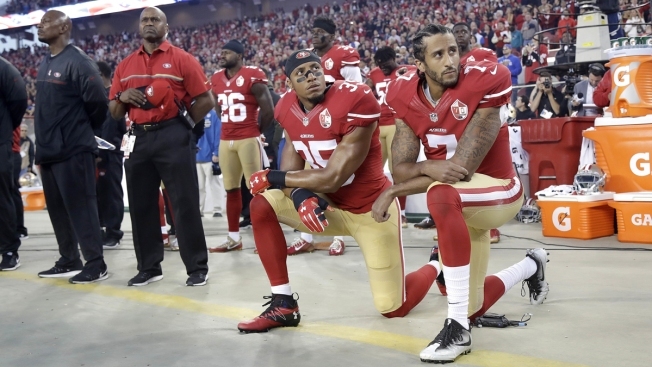 The NFL hasn't gone that far, but Kaepernick has yet to land another job and one of his former teammates and fellow protesters, safety Eric Reid, is also out of work. Both have filed collusion grievances against the NFL. 49ers CEO Jed York said his team abstained from the anthem vote on Wednesday, NBC Sports Bay area reported. Several other team owners also tweeted following the news. The NFL Players Association said it wasn't consulted on the new policy and vowed to "challenge any aspect of it that is inconsistent with the collective bargaining agreement." The new league policy doesn't define what it means to show respect for the flag and anthem. "NFL players have shown their patriotism through their social activism, their community service, in support of our military and law enforcement and yes, through their protests to raise awareness about the issues they care about," the NFLPA statement continued. "The vote by NFL club CEOs today contradicts the statements made to our player leadership by Commissioner Roger Goodell and the Chairman of the NFL's Management Council John Mara (co-owner of the New York Giants) about the principles, values and patriotism of our League." The NFL was reportedly considering whether to assess a 15-yard penalty against any player who took a knee or conducted any other protest during the anthem. Another possible option would have been to change up the pregame routine entirely, keeping teams in their respective locker rooms until after the anthem had played. That is the protocol long followed by college football, preventing anthem protests from being carried out on the field. In the end, the owners sent a bit of a convoluted message — appeasing those who feel the national anthem must be treated with reverence, while allowing some sort of conduit for players to protest as long as they stay out of the public eye. "We've spent a lot of time, not just at this meeting, but really over the last year discussing the issue of the anthem and working with our players to make sure we could get to a place where all the different viewpoints could be respected," said Art Rooney II, owner of the Pittburgh Steelers. "Obviously, we want to continue to work with our players and make sure they feel that their point of view has been respected. I think the fact that those who are not comfortable standing for the anthem have the right to stay off the field — so we're not forcing anybody to stand who doesn't feel that way about particular subjects — but those who are on the field are going to be asked to stand." Goodell said the league met with countless players over the last year to get their input on the anthem controversy. "We think that we've come up with a balanced process, procedure and policy that will allow those players who feel they can't stand for the anthem to stay in the locker room," the commissioner said. "There's no penalty for that, but we're going to encourage all of them to be on field. We'd like for all of them to be on the field and stand at attention." "Well, I think the general public has a very strong view of what respect for the flag is and that moment," he said. "We have language in our policy that talks about that, standing attention, hats off and focused. And I think the general arbiter will be the clubs and the league and we'll work with our players to get their viewpoint also."